The Cathedral Church of Saint Peter and Saint Paul in the City and Diocese of Washington, operated under the more familiar name of Washington National Cathedral, is a cathedral of the Episcopal Church located in Washington, D.C., the capital of the United States. 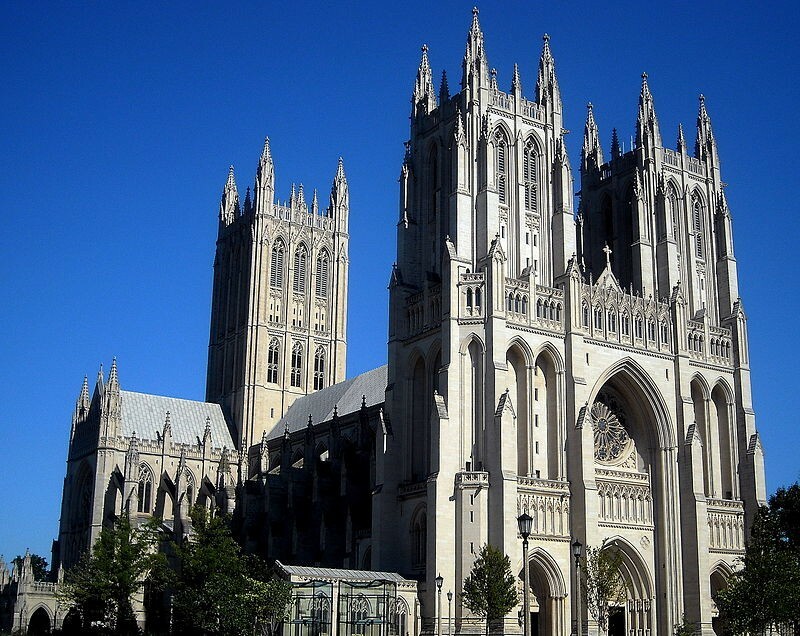 Of Neo-Gothic design closely modeled on English Gothic style of the late fourteenth century, it is the sixth-largest cathedral in the world, the second-largest in the United States, and the highest as well as the fourth-tallest structure in Washington, D.C. The cathedral is the seat of both the Presiding Bishop of the Episcopal Church, Michael Bruce Curry, and the Bishop of the Diocese of Washington, Mariann Edgar Budde. In 2009, nearly 400,000 visitors toured the structure. Average attendance at Sunday services in 2009 was 1,667, the highest of all domestic parishes in the Episcopal Church that year.